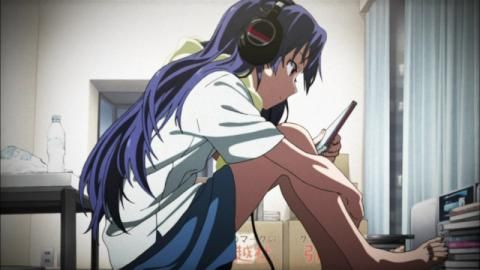 Following her decision to leave her pop idol trio, Mima finds herself struggling as a novice actress. The stresses of breaking into this new industry and the burden of her image as an idol weigh heavily on her. She tries to move forward, yet is haunted by a her past, as well as a mysterious stalker who seems to know everything about her. As events unfold, Mima becomes increasingly paranoid, and her perception of reality begins to crack under the strain. Note – Because it is very difficult to discuss a film like Perfect Blue without going into some detail as to its themes and message, there may be some minor spoilers in this review. If you are particularly sensitive to such things please, feel free to skip down to the Conclusions section. 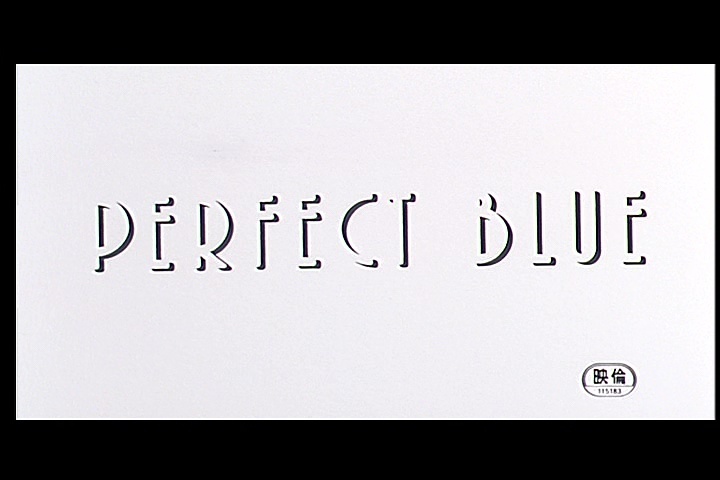 After rewatching Perfect Blue recently, it occurred to me how rarely the film comes up in conversation about anime feature films. This seems odd, considering how unique it is and what it has to say about personal and professional image, pop idols and fandom. These are all huge aspects of the anime and entertainment industries, so a chance to look at them more closely should be welcome. Perhaps its lack of inclusion is because the picture it paints is not a very flattering one. The film is certainly unlike most any other anime you’re likely to see, and has a lot to offer from both a storytelling and animation perspective. The film was directed by Satoshi Kon, also famous for his work on Millennium Actress, Toyko Godfathers and Paprika, among others. It was Kon’s directorial debut, and it displays his talent for psychologically-focused and reality-warping storytelling. It’s probably also his darkest work, and can be uncomfortable to watch at certain points. It’s a very intense film that doesn’t shy away from portraying a darker side of popular entertainment or the physical and psychological dangers facing actors and producers. 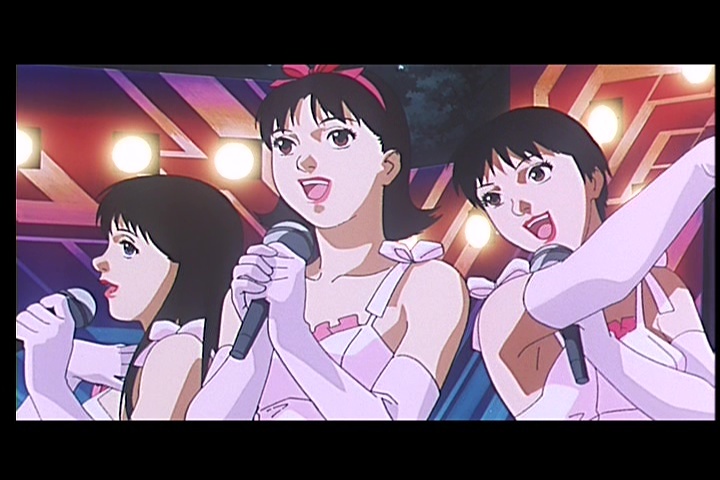 Perfect Blue starts off at a concert that some of you may recognize from countless dance AMVs. Mima, a member of the idol group CHAM!, announces that she is going to retire from singing to become an actress. This is met with disappointment and anger from her fans, and her image as a “pure and innocent” idol follows her as she tries to make her way into film and television. She agrees to violent and explicit roles as part of her attempt to shed this image, which only makes the pushback worse. The movie shows Mima’s fight to be taken seriously and succeed in spite of the fickleness and possessiveness of her fans. She demonstrates a lot of strength and conviction, even as terrible things begin to happen around her and threats to her and the people she knows grow ever more intense. This may seem extreme, but similar things have happened in real life. Remember that we live in a world where a 20-year-old idol singer made a tearful apology for having a boyfriend, and others from the same group have been violently attacked. Perfect Blue’s story shines a light on the uglier side of the relationship between performers, their managers and their fans. As the film progresses, the stresses of her job transition begin to wear on Mima’s psyche. One of her managers wants her to break from her past and encourages her to take on “mature” roles, while the other pushes back against the drastic change to her acting persona. At the same time, she begins to see someone stalking her around the sets and on the street, and even discovers a website that chronicles her day-to-day life in terrifying detail. The strain eventually becomes so great that days start to blend together and she starts to question her own senses. This is all handled beautifully, with quick cuts between scenes and tense, unsettling music that puts you on edge. The tightly-focused story is complemented by some truly spectacular animation. While the earliest scenes in the movie look very basic (some might go so far as to say cheap), the smoothest and most impactful animation is saved for key scenes, such as the iconic dance sequence and two intense chases later in the film. All of the characters are incredibly expressive and have a sense of depth and weight to them that is often lacking in other anime. Kon’s characters always feel very solid and are constantly interacting with the world, which makes everything quite absorbing. It’s this believability that I feel makes Kon’s work so iconic. His specialty is in using high-quality animation and clever cuts to follow a psychological journey, as seen in Memories: Magnetic Rose and Millennium Actress. By grounding the characters and setting so well, he and the animation crew are able to create a great sense of unease when they start to tweak things. Deliberately unsettling camera angles, rapid changes in perspective and other tricks put you into Mima’s shoes as she starts to question her own sanity. A sequence in which she goes through several days waking up and wondering if anything she remembers was real or just a dream happens so rapidly that it left my head spinning, which is exactly what it needed to do. One particularly well-animated sequence that follows this method of twisting reality is a scene in which Mima runs through the production studio she works at. She stumbles and sprints through the building, rebounding off walls and knocking people over. This well-choreographed and solid motion is exceptionally well animated, and one of the best sequences in the entire movie. It helps pull you into the world and feel like you are in the characters’ shoes. 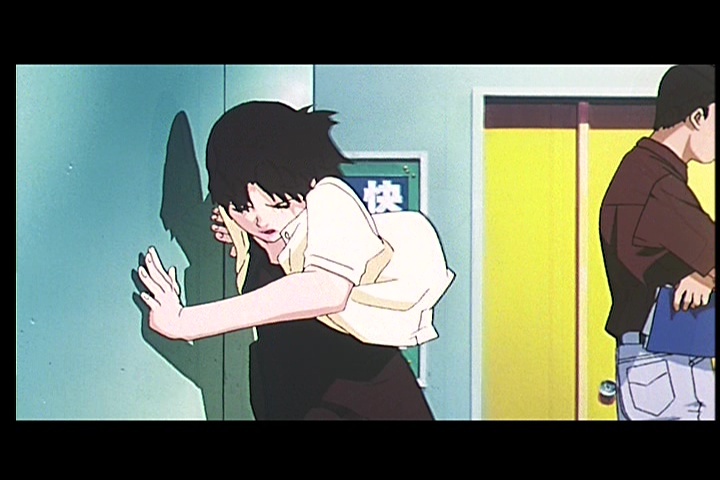 Along with keeping the audience in an extremely uncomfortable headspace through cinematography, Perfect Blue also highlights incidents of violence with unflinching detail. Violent scenes are shown with harsh focus, and it makes them physically uncomfortable to watch. Nothing about these scenes is gratuitous or titillating, and that is absolutely perfect. The creators wanted to make sure that these brutal acts made the audience anxious, and I was squirming in my seat as they happened. They are supremely ugly, as they should be. While the animation and storytelling are consistently excellent throughout the movie, there are a few parts that are weaker than others. Throughout the film, Mima is acting in a TV crime drama that mirrors her real-life situation so closely that it’s a bit too on-the-nose. At another point, she goes on a brief monologue about fantasy and reality that seems out of place for her otherwise very non-philosophical nature. Neither of these things drag the movie down too much, and it’s a testament to the rest of the film that they are the only parts that stick out to me as feeling particularly unsubtle. Perfect Blue is a competent psychological thriller, which is quite rare for an anime. 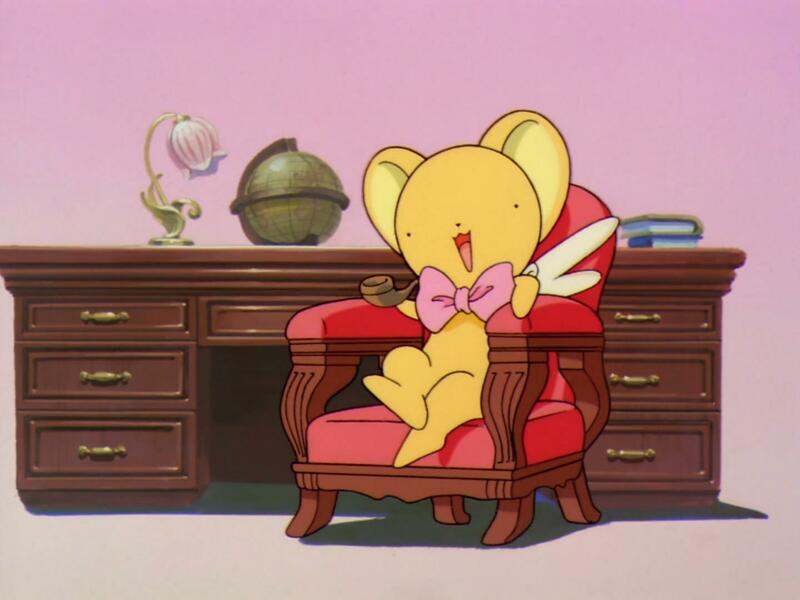 Other than Monster and Paranoia Agent (the latter was also created by Satoshi Kon), I find it difficult to think of any other movies or shows that fit into that genre. This may be due in part to the fact that the strengths of animation don’t lend themselves as well to stories that are grounded in reality. Animation’s greatest strengths are usually stylization and making the impossible or alien feel consistent with the world. Watching characters fly through the air or punch each other in giant robots feels more “real” when the visuals are divorced from reality. Perfect Blue, on the other hand, is firmly set in the “real world”, and could easily have been conceived as a live-action project. In fact, that was the original intent, until an earthquake in 1995 damaged the production studio and the budget was cut. Despite what could have easily been a huge setback, Kon was able to use the medium of animation to achieve a feeling of unease that sets in early and only grows as the movie progresses. It’s great to see a director and production team using the medium to push visual storytelling this hard. 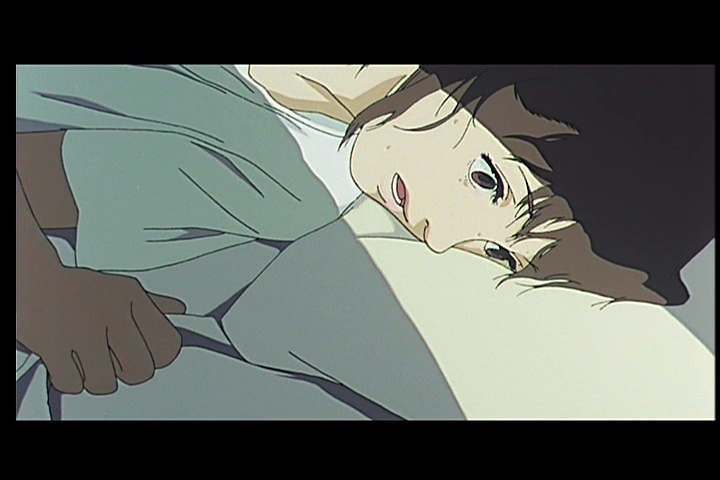 Satoshi Kon’s passing in 2010 was a great loss for the animation community and fans of animated storytelling alike. His entire library of work is worth looking into, but Perfect Blue still stands out to me as his most emotionally challenging film. It has served as inspiration to filmmakers such as Darren Aronovsky, who directly referenced it in Requiem for a Dream. If you have any interest in psychological thrillers or quality animation, I cannot hesitate to recommend Perfect Blue.